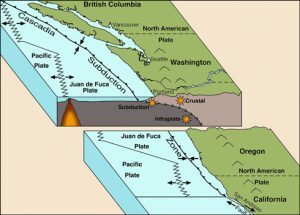 On this page, you will be able to learn the basics about the Cascadia Subduction zone and get aquainted with the importance of studying it. 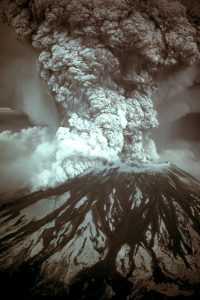 This page will also be a great source that will be periodically updated with new research available to help encourage a throrough understanding of the implications of this subduction zone in the Pacific Northwest. 1 What is the Cascadia Subduction Zone and why does it matter? 2 So, what is Cascadia Initiative? 3 How can you be involved? What is the Cascadia Subduction Zone and why does it matter? The Cascadia Subduction Zone (right) stretches from northern California to Vancouver Island, British Columbia, and from a series of ridges where new oceanic crust forms under the Pacific Ocean to east of an active chain of volcanoes, is a geologically-hazardous place to live. For example, the cataclysmic eruption of Mt. St. Helens in 1980 resulted in 57 deaths, a 25km tall eruption column, and over a billion dollars in damage (below left). Cascadia is also subject to infrequent, very large (> 8.5Mw) earthquakes, similar to the March, 2011 Tohoku earthquake off the northeastern coast of Japan, which can trigger large tsunamis and substantial shaking. 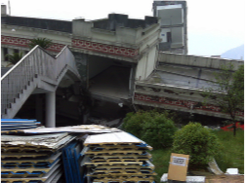 As was unfortunately emphasized during the 2010 6.9Mw Yushu earthquake, for example, schools can fall down during this shaking, resulting in fatalities (right). Many schools in the Pacific Northwest are of older, cinder block construction and were designed for smaller earthquakes that the ‘megathrust’ events (earthquakes) now known to occur in Cascadia. In short, many Pacific Northwest public schools are at risk of falling down on their occupants during a Cascadia megathrust event. So, what is Cascadia Initiative? The Cascadia Initiative is studying the Cascadia Subduction zone both onshore and offshore. One of the main goals of Cascadia Inititive is to improve the understanding of megathrust earthquakes and the implications for those within the hazardous zone of the impact. Through this goal, Cascadia Initiative is hoping to increase education and awareness of the Cascadia Subduction zone and the impact of a megathrust earthquake in the Pacific Northwest. Please check out the current education and outreach programs offered by Cascadia Initiative.